Jean "Django" Reinhardt (January 23, 1910 – May 16, 1953) was a Gypsy jazz guitarist. One of the first prominent European jazz musicians, Reinhardt remains one of the most renowned jazz guitarists due to his innovative and distinctive playing. With violinist Stéphane Grappelli he cofounded the Quintette du Hot Club de France, described by critic Thom Jurek as "one of the most original bands in the history of recorded jazz." 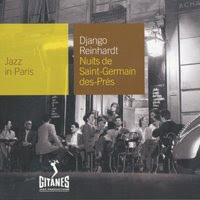 Reinhardt's most popular compositions have become jazz standards, including "My Sweet", "Minor Swing", "Tears", "Belleville", "Djangology" and "Nuages" (French for "Clouds"). Born in Liberchies, Pont-à-Celles, Belgium, Reinhardt's Gypsy nickname "Django" was Romani for "I awake." He spent most of his youth in gypsy encampments close to Paris, playing banjo, guitar and violin from an early age professionally at Bal-musette halls in Paris. He started first on the violin and eventually moved on to a banjo-guitar that had been given to him and his first known recordings (in 1928) were of him playing the banjo. At the age of 18, Reinhardt was injured in a fire that ravaged the caravan he shared with Florine "Bella" Mayer, his first wife. They were very poor, and to supplement their income Bella made imitation flowers out of celluloid and paper. Consequently, their home was full of this highly flammable material. Returning from a performance late one night, Django apparently knocked over a candle on his way to bed. While his family and neighbors were quick to pull him to safety, he received first- and second-degree burns over half his body. His right leg was paralyzed and the third and fourth fingers of his left hand were badly burnt. Doctors believed that he would never play guitar again and intended to amputate one of his legs. Reinhardt refused to have the surgery and left the hospital after a short time; he was able to walk within a year with the aid of a cane. His brother Joseph Reinhardt, an accomplished guitarist himself, bought Django a new guitar. With painful rehabilitation and practice Django relearned his craft in a completely new way, even as his third and fourth fingers remained partially paralyzed. Hence, he played all of his guitar solos with only two fingers, and managed to use the two injured digits only for chord work.